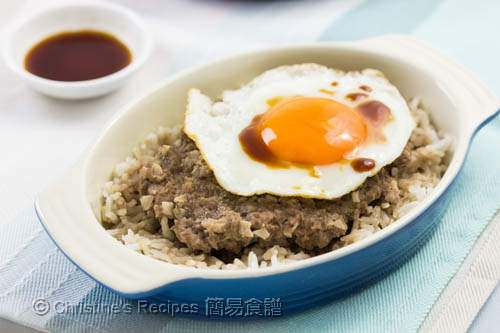 Ever tried this Hong Kong rice dish, steamed beef mince on rice? It's one of my favourite childhood steamed rice dishes. I especially love the grains because they absorbed all the beef juice and sauce. So tasty! Sometimes you may need a recipe to let yourself be lazy for some reason, not wanting to stand in the kitchen too long or dine out. No matter what the weather is like, this delicious steamed beef on rice is perfect to ease your starving. My mother used to make this rice dish in an electric rice cooker. Yet a wok or hot pot will do too. The end result is equally good. All you need is to prepare some cooked rice that’s a bit drier than usual because the rice will take up every bit of the tasty beef juice while steaming. You can imagine how yummy the rice will be. Apart from making fried rice, you can turn leftover rice into another superstar on your dining table with this recipe. Soak the preserved cabbage in salted water for about 10 minutes. Rinse and squeeze out excess water. Set aside. Stir and combine the beef, water chestnuts, preserved cabbage and marinade together towards one direction. Place the cooked rice in two dishes. Divide the marinated beef on top and level with a spoon. Steam in a wok over high heat for about 12 minutes, or until the beef is cooked. In the meantime, pan fry two eggs to your liking. Transfer them onto the beef. Drizzle light soy sauce as desired. Serve immediately. Preserved cabbage will enhance the flavour and take the whole dish up a notch, available at Asian grocers. 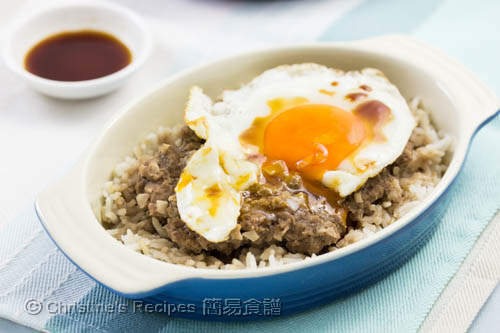 If you’d like to make this dish with an electric rice cooker or a claypot on stove, you may quickly place the marinated beef on top of the rice when the water starts to dry up. Cover and let the rice cooker do the rest for you. You can use freshly cooked rice with less water, or leftover rice. Can I use potato starch instead of corn starch to marinate the beef? Yes, you can use potato starch with the same amount for marinating. Hiya - just wondered if I could use sauerkraut instead of the preserved cabbage? I make my own sauerkraut just by salting cabbage and weighting it down so that the liquid comes out of it and it preserves in it's own liquid. thanks so much for your recipes - I really do love them! Feel free to experiment with your homemade salted cabbage. I can tell it must be totally different in taste with the one I bought. But why not? Let me know how it goes. Since some members of my family do not take beef, can I replace beef with minced pork and is there any changes in the cooking steps? Think that pork will work too. 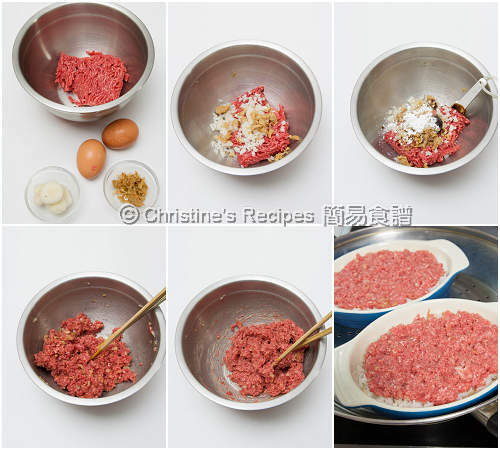 Simply replace the minced beef with minced pork following the same cooking steps. Can I replace minced beef with minced pork, and are there any difference in the cooking steps? This looks very delicious and it's not even difficult to make. Thanks for sharing, Christine. Hi Christine, I'm from Singapore and I was wondering whether your preserved cabbage is 'chye poh'? I don't read Chinese unfortunately. It's not 'chye poh' exactly, but quite similar. Click the link of "preserved cabbage (冬菜)" in the recipe and you'll see the picture of it. Hi Christine, thank you for sharing this recipe. It is so easy and yummy! I am just wondering why you need to soak the preserved cabbage in salted water. Isn't the preserved cabbage already very salty? The other way around, the preserved cabbage will be diluted in taste and become less salty after soaking in salted water, as the cabbage has higher concentration of salt that will be drawn out from it. Also, this step helps remove some of the chemicals, like pesticide residues, if there's any. I finally made this tonight after saving your recipe months ago. We didn't have water chestnuts so I subbed some freshly cut up cabbage with it. I had the preserved cabbage as well, wasnt sure if I was meant to rinse it off after soaking it in salty water? Still not sure but I have to say we found the recipe very, very delicious. We might add more vegies next time and drop the amount of meat or cook the rice in meat stock of some sort next time as we are real vegetable lovers and don't eat meat so often. Also, by mistake I dropped one egg on top of the rice dish before cooking. It was a mistake and much better to fry as you suggest. Lastly, we covered the frying pans filled with water, with lids but still it took closer to 20 mins to cook the dish through. Thank you for this lovely recipe! Thanks for trying my recipe. And so glad that you managed to make it to suit your family's taste buds. We usually have a vegetable dish as a side to go with this meat dish to balance the meal. Yes, we also have a variation of making this dish by dropping an egg on top to steam, just like the chefs do in Chinese restaurants. It's another version. No matter how, this dish is a keeper. Thanks for sharing your precious experiment results. Hi Christine, thanks for sharing your recipe! I tried your marinade with sliced beef, and it was marinated for abt 20 minutes. They turned out bland. Is there a difference between using minced beef & beef slices? Suppose that your measurements were correct, it won't be any big difference in taste for this dish. The amount of marinade is just enough. The preserved cabbage is salty and has flavour. 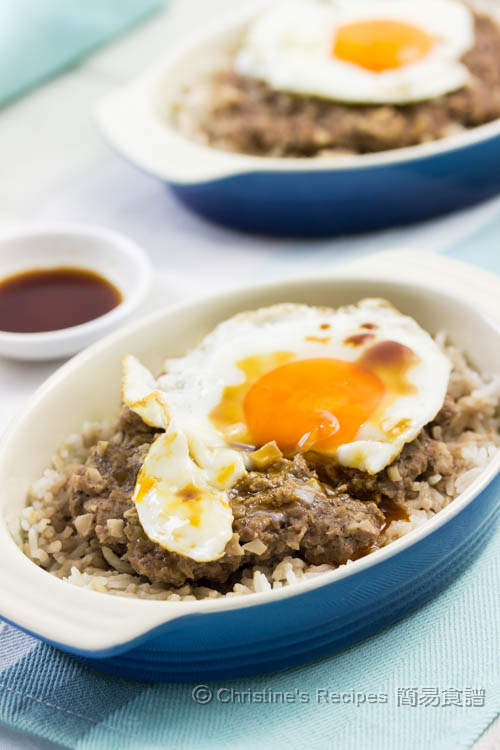 Traditionally, we like to drizzle some soy sauce on the fried egg, eat with the rice. We find this dish is very tasty, not bland at all. But if you use this amount of marinade to mix with sliced beef for other use, making a different dish, then it's probably not enough. Actually I only used the marinade for the sliced beef, and did not mix with the salted cabbage. Probably that's why it didn't taste as nice. Thanks for the tip! No wonder. Just what I guessed. The marinade in this recipe is quite versatile for making Chinese dishes. You may add more of it for sliced beef when making other dish next time.